This radiator has 3 rows of 1/2" tubes in a high efficiency tube pattern. It has a trans cooler. This radiator is an exact replacement 57 Mercury radiator for a 312 engine.100% Made in USA 1 Year Guarantee Inquire about Turnpike Cruiser radiators. This radiator has 3 rows of 1/2" tubes. It has a trans cooler. This radiator exceeds to the largest radiator available from Ford when the car was built. This is for a 6 cylinder engine. 100% Made In USA It has the straps flush on the engine side. This radiator has 3 rows of 1/2" tubes. It has a trans cooler. This radiator is equal to the largest radiator available from Ford when the car was built. It is 100% Made In USA. 1 Year Guarantee. This radiator has 3 rows tubes in a high efficiency pattern. 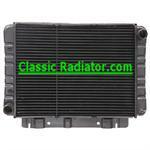 It is exceeds the biggest radiator Ford used in these cars. It is designed to bolt in just as the OEM radiator does. 100% Made in USA. 1 Year Guarantee. This radiator has 3 rows of 1/2" tubes on 9/16" centers. It is equal to the stock radiator Ford used in these cars. It is designed to bolt in just as the OEM radiator does. 100% Made in USA. 1 Year Guarantee. This radiator has 2 rows of 1" tubes. It will cool up to 400 horsepower. It is designed to bolt in just as the OEM copper radiator does. This radiator is for a manual transmission car. It is also available with a trans cooler. 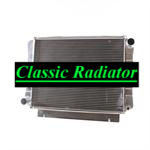 This copper/brass radiator will fit a 1960 to 1963 Ford full size car with a 6 cyl engine. It has 2 rows of tubes. This is a New Old Stock Aftermarket radiator. It has never been installed in a car and is in excellent condition. It has a trans cooler. This radiator has 3 rows of 1/2" tubes on 9/16" centers. It is equal to the biggest radiator Ford used in these cars. It is designed to bolt in just as the OEM radiator does. It is for a manual transmission car. Also fits 61 to 63 Mercury. 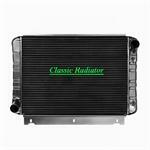 Featuring a high efficiency core design, this radiator exceeds the biggest radiator Ford used in these cars. It is designed to bolt in just as the OEM radiator does. It is also available without a trans cooler. Also fits 61 to 63 Mercury. This radiator has 3 rows of 1/2" tubes on 3/8" centers. It is exceeds the biggest radiator Ford used in these cars. It is designed to bolt in just as the OEM radiator does. It is also available with a trans cooler. Also fits 61 to 63 Mercury. This radiator has 4 rows of tubes. It is exceeds biggest radiator Ford used in these cars. It is designed to bolt in just as the OEM radiator does. For automatic transmission applications. Also fits 61 to 63 Mercury. This radiator has 4 rows of tubes. It is exceeds the biggest radiator Ford used in these cars. It is designed to bolt in just as the OEM radiator does. It is also available with a trans cooler. Also fits 61 to 63 Mercury. This radiator has 3 rows of 1/2" tubes on 9/16" centers. It is equals the biggest radiator Ford used in these cars. It is designed to bolt in just as the OEM radiator does. 100% Made in USA. 1 Year Guarantee.